These old and tired treads were given new life when they were covered with fiberglass stair tread covers. why not just cover stair treads that are old and worn out? 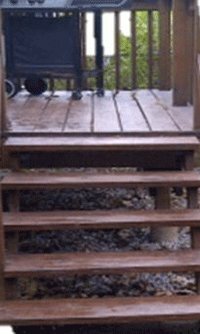 When you consider all the rain, snow, heat and cold that your deck is subjected to over the years, you have a recipe that will accelerate the aging of any wood stair treads. And depending on your climate, they can be dangerous in the winter months with snow and ice building up on each tread. So what do you do to repair this? 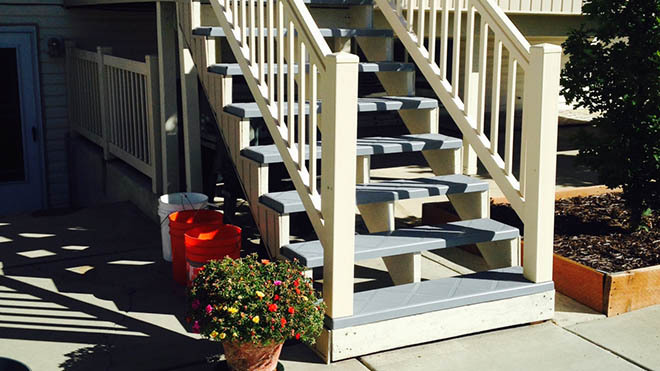 If that is what you are seeing on your porch or deck, you have a couple options - Replace, Resurface, or try using Stair Tread Covers. Which option is right for you? No secret here. Lots of finicky hard work required to remove each stair tread and replace. You will have to remove screws in the treads - if you used screws. Or if you used nails to secure the boards, a hammer from underneath or a pry bar are your only options. Try to remove each step carefully without damaging stringers or the kick plate. 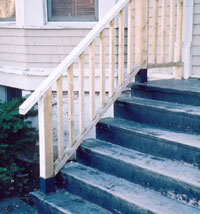 Examine the condition of the stair stringers and if they are not rotted then replace each tread with new boards. If the wood wear is superficial and no rot is present, sanding and refinishing the surface could do the trick. This is the most common way of reviving a worn set of stair treads. But while you are at it you might want to consider adding a textured finish to the treads. This makes the tread safer. There is no easy way to do this. There are grip tape products with adhesive backing similar to what you might see on skateboard but they only adhere well to smooth sealed surfaces in order to have any chance of lasting. Another possibility would be to use some epoxy or polyurethane resin mixed with some grit. These kinds of materials can all be purchased in a local specialty plastics shop. Epoxies have trouble with sun and tend to discolor and break down quickly unless they have the right UV protectors in them. Non epoxy resins don't have this problem. But really what you are doing here is a lot work. It's messy and quite a hassle when all that is really needed is some kind of outdoor stair tread cover that fit over the treads. One of the best stair covering ideas I have seen is this product. It's a simple idea, as all great ideas are. It is essentially a molded shell that covers the treads either partially or completely. They're called Composi-Grip Stair Covers and not only do they totally cover worn beaten up treads but they also have a great grip on them that works in the winter unlike grip tape or resin with grippy grit embedded in it. 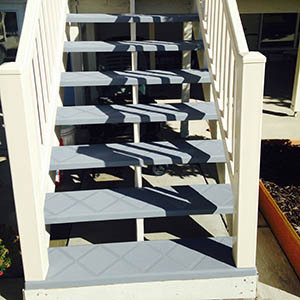 These stair coverings are made of a very durable plastic material that can handle extreme hot and cold temperatures without getting brittle and breaking or getting soft in the heat. The concept is simple, just cut the cover to the desired length, sand and smooth the stair tread surface, apply some construction adhesive and lay down the cover on top of the tread. Now you have a clean looking and safe to use surface. This is much faster than a complete re-build of the staircase that would be vulnerable to the same wear and tear life cycle as before. Completely cover an entire single tread or just the main traffic area of the steps. This is a cutaway view of the stair tread covers over one tread just to show what is going on. You have to sand and smooth off the wood and apply some construction glue before putting on the cover. They are 47-½" long and 10-¼" wide. The stairs shown above have open rises so the treads are completely covered. But if your treads are sized differently the stair tread covers will still work fine. Just cut off the two ends and lay it down on a bed of construction adhesive and you are done. 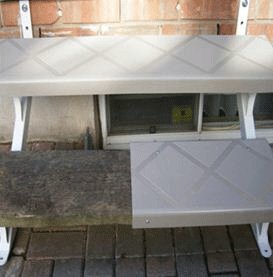 If the treads are shorter or longer cut the two closed ends off to length and then cut the back side of the stair cover off so it does not hit the back riser. 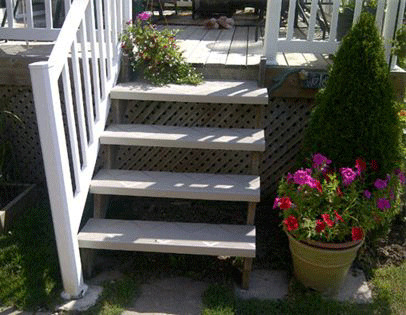 This is a very clean attractive look and turns a beat up old set of deck stairs into a safe long lasting solution. 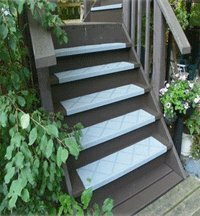 The same idea for stair tread covers on indoor treads, outdoors or concrete porches also works. 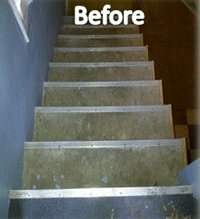 Resurfacing these basement stairs was a simple matter. We really like your steps! We glued, weighted them down, and they turned out wonderful. Very sturdy feeling, look good,and feel comfortable when walking on. 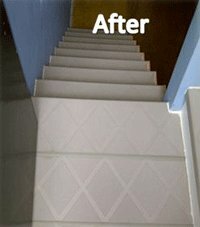 This is a new product for covering stairs I found and thought really deserved some attention. Obviously it is helping people out and saving them a lot time and money that would otherwise be spent on tearing down and rebuilding stairs. It may not be available everywhere yet but it is now available here at DecksGo. If you think this kind of tread repair option would be good for you I recommend you contact us for more information. There you have it. 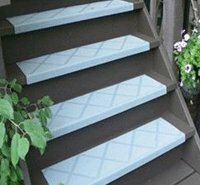 Some very simple ways to repair, resurface or try stair tread covers for worn out stairs. Covering rather than rebuilding or resurfacing stair treads with epoxies and resins can be a great option. This is a DecksGo Recommended Product. It's one that we are confident you will be happy with and has a great track record as a top performer in its category. 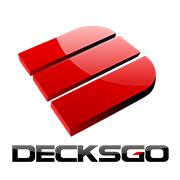 DecksGo was one of the pioneers to bring this product to the market. And you can expect more great "first" moments like this. This is what we do - try to bring you leading edge building solutions before anyone else.